Categories: Ashada Ekadasi, Bhaktas, Bhakti, Compassion of God, Deities, Divine Names, Festivals, Grace of God, Kshetra, Pandharpur, Panduranga, Panduranga Bhaktas, Spirituality. God doesn’t differentiate devotees based on birth, color, race, wealth, region or religion. He responds only to true love and devotion. Lord Vittal in Pandarpur has performed many lilas with His devotees, which proves this time and again. 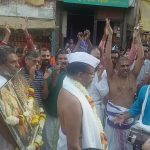 The Lord says to Narada, “nAham vasAmi vaikunTe, na yogi hridayeravau| mad bhakthA: yatra gAyanti tatra tishTAmi nArada||” (oh Narada! I neither reside in Vaikunta nor in Yogi’s hearts. I can be found wherever my devotees sing my Names!) The Lord of Vaikunta indeed, descended in Pandharpur to relish the incessant Nama Sankirtan of the sadhus and to play his divine lilas with his devotees in order to bring out the greatness of their devotion for Him. Numerous devotees like Namdev, Janabai, Tukaram, Senanayi had immense love for Vittal and spent their lives singing His Names and glories. These devotees belonged to various strata of society. Some were learned scholars and rich merchants while others were in abject poverty and made their living as boatmen, barbers, weavers, tailors, cobblers and so on. But their love for Lord Vittal was pure and blemishless and so was the Lord’s love for them. Koma Bai was a poor old lady who lived on the banks of Chandrabhaga river across Pandharpur. Her only wish was to visit the Pandharpur temple to have the darshan of the Lord. Since, she did not have any money, the boatman in her village refused to take her to the other side of the Chandrabhaga river. It was getting dark and she prayed to Lord Panduranga to help her. Just then, the boatman who had earlier refused, offered to take her across the bank. Her joy knew no bounds and she promised that she would pay him the next day. In Pandharpur, she had a wonderful darshan of the Lord. She sat there singing bhajans outside the temple and received alms. She went to the boatman to pay him for the ride. But, the boatman surprised her saying that he did not bring her across the river. She realized that Lord Panduranga himself came in the form of a boatman and helped her out. Another time, the Lord came down as a barber to save his devotee, Senanayi. Senanayi, a barber by profession, constantly sang the Names of the Lord and led a very honest life. When the king was searching for a royal hairdresser, the citizens unanimously voted in favor of Senanayi owing to his honest and sincere nature. Once, when Senanayi was heading to the palace to dress up the king, few sadhus passed his way singing the divine names of Lord Vittal. Senanayi instantaneously joined them and lost himself in Nama Sankirtan and missed turning up for his job. Some miscreants complained to the king that Senanayi had shirked his duty to join the Sadhus. The king became furious and ordered the arrest of Senanayi. As he went to get dressed, he was surprised to see Senanayi waiting for him patiently. As Senanayi placed his hand on the King’s head to dress him up, the king had a very divine and calming experience and felt the presence of Lord Krishna. He was lost in this bliss for a long time. Just then, the actual Senanayi arrived and apologized for the delay. But the King’s hair was already dressed. Both Senanayi and the king realized that it was verily Lord Vittal who had come down as a barber to save his devotee. Once again the Lord proved that he would go to any extent to save his devotees. Another great Panduranga Bhakta was Chokamela who, despite hailing from a slum, led the life of a true vaishnava and always chanted the Divine Names of the Lord. Owing to his caste, he was denied entrance to the Pandharpur temple. He would stand all day long outside the temple compound and sing the Divine Names joyfully. 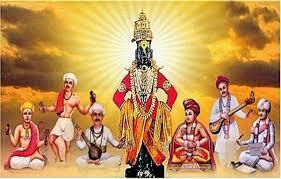 Lord Panduranga relished every Nama he chanted more than even the puja performed by the priests in the temple. One night, after the priests had locked the temple, Lord Panduranga came to Chokamela’s home to spend the night with him. Chokamela requested the Lord to take him inside the temple, as he had never been inside before. In a flash, the Lord took him inside the sanctum sanctorum of the temple and they talked all night long. In the morning, the priests opened the doors of the temple and were shocked to find Chokamela inside. They cursed him and took him to the King. Though Chokamela pleaded that it was the Lord who brought him in, nobody was willing to believe his words. The king, without proper enquiry, punished him by banishing him from Pandarpur. Chokamela silently accepted this also as the will of God and settled outside the city. Chokamela and his wife had a practice of fasting on Ekadasi days and breaking his fast on the following Dwadasi day by inviting home a guest to partake of the meals. On such a Dwadasi day, they had the most special visitor – the Lord himself! From then on, this became a routine affair. On one such Dwadasi, Chokamela chided his wife for spilling yoghurt on the Lord’s garments while serving Him food. The learned ones who overheard this were amused and thought that Chokamela was out of his mind. But, when they went to the temple, they witnessed an unbelievable sight! The Lord’s robes indeed, had stains of yoghurt! They realized their mistake and begged Chokamela for forgiveness. Everyone realized the greatness of Chokamela and hailed his bhakti. It can be seen from these stories that Lord Panduranga doesn’t distinguish between his devotees. He is the epitome of Saulabya or simplicity and comes down to mingle with his devotees bound only by their true affection and devotion. Ashada Ekadasi which is very special to Lord Panduranga falls on July 27 this year. On this auspicious occasion, let us all sing the Names of the Lord and pray for true devotion to Him. 2 Responses to "God is Equal!"